Zion Market Research has published a new report titled “LiDAR Market by Component (Laser, Scanner, GPS Receiver, Inertia Measurement Unit (IMU), High Precision Clock, and Others), by Product (Topographic LiDAR and Bathymetric LiDAR), by End-use Industry (Space Exploration, Meteorology, Automotive, Defense & Marine, Construction, Mining, and Others): Global Industry Perspective, Comprehensive Analysis and Forecast, 2017 – 2024”. According to the report, the global LiDAR market accounted for USD 688.6 million in 2017 and is expected to reach USD 2,136.7 million globally by 2024, growing at a CAGR of around 17.6% between 2018 and 2024. LiDAR is a machine that uses a laser to detect the position and motion of an object. The machine emits light which is reflected from the three-dimensional object’s surface. The system then generates details about the object. LiDAR consists of systems to map and display results. The technology is used in various industries such as automotive, mining, defense, construction, power generation, and meteorology. Increasing usage of LiDAR in the mining applications is preliminarily fueling the market growth. LiDAR is used to assist mine operators with mine planning and slope stability assessment. In 2017, top 40 global companies in the mining industry generated revenue of about USD 600 billion as compared to USD 490 billion in 2016. Increasing investment in the mining industry is expected to propel the LiDAR market. In 2017, Russia and China raised about USD 1 billion to invest in Russia’s mining industry. Government initiatives in India will further lead to the growth of the market. In 2018, the government of India allowed 100% Foreign Direct Investment in coal mining. Thus, it is anticipated that the mining industry will contribute significantly to the growth of LiDAR market. The usage of LiDAR in power generation has been noteworthy. The rising investments in this sector are expected to fuel the growth of the LiDAR market. The global investments in clean energy technology were about USD 333 billion in 2017 as compared to USD 324 billion in 2016. In 2017, China was the leading investor with USD 132 billion followed by the U.S. with USD 57 billion. This number is estimated to rise during the forecast period. Thus, the growth of the LiDAR market in the power generation sector is evident. Laser, scanner, GPS receiver, Inertia Measurement Unit (IMU), high precision clock, and others are the component segment of global LiDAR market. Laser segment holds a considerable share in this segment and is expected to propel in the forecast period. The share is attributed to the increasing adaptation in the automotive sector. Further, the LiDAR market is classified on the basis of product into Topographic LiDAR and Bathymetric LiDAR. Topographic LiDAR segment is estimated to boost at a significant rate during the forecast time frame. The growth is projected due to the use of Topographic LiDAR in various industries such as meteorology, construction, mining, agriculture, and transportation, among others. North America holds a substantial share in the LiDAR market during the forecast period. The U.S. is projected to contribute significantly in the LiDAR market during the forecast timeframe. This growth is attributed to growing investments in the space exploration projects. In the Asia Pacific region, China is expected to be the most lucrative nation for LiDAR market owing to the technological advancements in the construction sector. China’s construction industry is also proving to be a good opportunity for the LiDAR market. 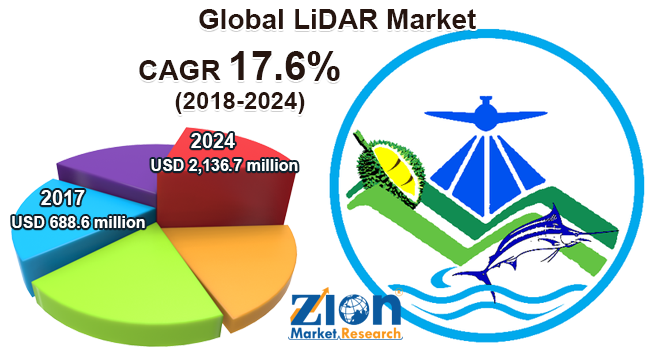 Prominent manufacturers in the LiDAR market are Leica Geosystems Holdings AG, Teledyne Optech Inc., Quantum Spatial, Inc., Faro Technologies, Inc., Velodyne LiDAR, Inc., Sick AG, Geokno, Trimble, Inc., RIEGL USA, and YellowScan, among others. Top players are concentrating on upgrading their products to cater to the increasing demand in the emerging markets.